"I don't think there is anything wrong with a person who is truly overweight wanting and having the goal of losing weight. In fact, a doctor will tell that person to do that--the vast majority of health problems in this country come from obesity, and if losing 30 pounds will allow someone to live a longer and healthier life, I think that is a great goal and should not be looked down upon. I encourage my husband to exercise because I want him to be around longer and not have the same health problems of high cholesterol as his dad. How do you feel about health issues and weight? I have never noticed you to address this issue when talking about body image." After 35 years of medical practice combating disease and lifestyle flaws, and of watching my own powers ebb, I’ve stumbled onto two pieces of encouraging news. I recently ran across this graph, which gives me hope—and pause. 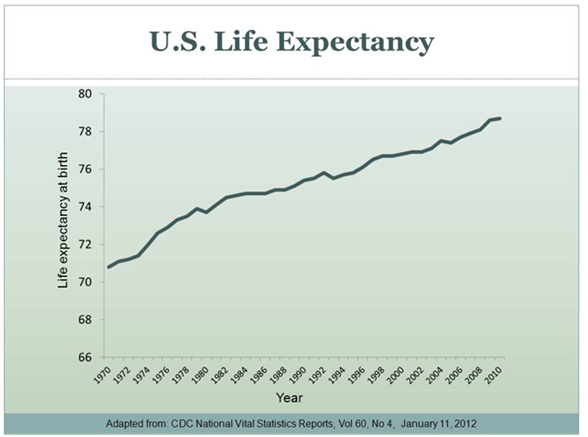 When I was in school, American male life expectancy was 69 years. Now that I’m edging up to that cliff and not just a little concerned, out comes a graph like this, which somewhat gratuitously adds another nine years of life. And what’s more, those of my age group who managed to escape the ravages of the young: birth defects, hang gliding accidents, homicide, suicide, and military service, average life expectancy reaches 83! How can this be? What about all the talk of cancer, heart disease, diabetes, violence, environmental decay, unsafe foods, and obesity ruining society as we know it? How can people be living longer each successive year if the health of the nation is going to pot? Is someone playing Chicken Little? Did I say obesity? I’m an expert, having personally lost 50 pounds three times. The same 50. My daughter Janna, an eating disorder expert, got to me, so I threw away my scales, gave up dieting, started eating intuitively and (I don’t know for sure without scales) have accumulated approximately 50 pounds back again, but not without guilt and concern they might jeopardize that magical average life expectancy of 83. And then came the other piece of good news. This January a large study on BMI (a measure of weight per height) and mortality showed that “overweight” people (BMI from 25-30) actually have significantly lower mortality than people who are underweight, normal in weight, or obese (BMI>30). Further, the “grade I obesity” group (BMI 30-35) had the same mortality rate as the normal weight group. So, increased risk of dying afflicts thin people and very obese people. And a bonus for me: for people over 65, no BMI, high or low, predicts mortality. Let me bring these findings home to you. Since you likely measure yourself with scales, presumably you’re more familiar with weight in pounds than BMI. For a 5’7” woman, the weight range associated with the longest life would be 160-191 lbs. That’s right. Just take a moment to ponder that. And we’ve been calling this category “overweight.” For the same woman, 192-223 lbs. would confer the same life expectancy as a “normal” BMI. Doctors call this grade I obesity. I think we should change the names to extra-healthy and pleasantly plump. Now that is contrary to logic and to everything we doctors have been preaching for decades. (I recognize that some of you readers or your doctors are going to be skeptical. If so, check out the references at the end.) It looks like society’s hysterical drive to thinness isn’t just driven by fashion, but by the medical profession itself. Maybe doctors’ offices need to throw out the scales, too. This isn’t just any study. It is a “meta-analysis” which considers the 141 best research studies on BMI and mortality involving 2.88 million individuals and over 270,000 deaths, and was published in the highly respected Journal of the American Medical Association (JAMA). So those are good tidings that ease my conscience and my fears. Of course, none of this means that good food and regular exercise aren’t linked to longevity. They are. And we will all die someday. Most of us will get sick. It just means we doctors can do more harm than good when we recommend a target weight and dieting to everyone above a certain BMI. In a letter to the editor of JAMA following publication of this article, Swapna Abhyankar MD and Clement J. McDonald MD chimed in aptly, suggesting to doctors: “…we also wonder if it is time to simply reject the notion that being overweight or mildly obese is always bad for patients and to stop hounding such patients about their weight.” Amen. And me? I’m going to enjoy this pleasantly plump body of mine, feeding it whatever makes it feel loved, making sure that my daily walk is a pleasure, not a duty, and hoping those extra 14 years of life expectancy will count for something. 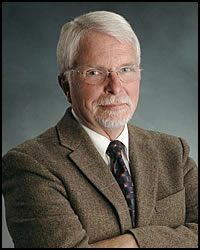 35 years in medical practice, former Utah Medical Association President, AMA officer, National Family Doctor of the Year, noted medical quality improvement expert, over 30 published academic articles.